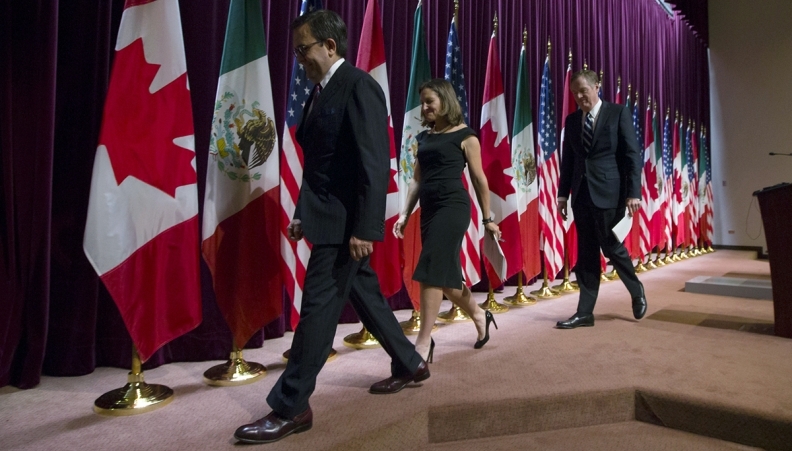 From left, Ildefonso Guajardo Villarreal, Mexico's secretary of economy; Chrystia Freeland, Canada's minister of foreign affairs; and Bob Lighthizer, U.S. trade representative, are seen walking off the stage after a September 2017 press conference in Ottawa. Mexico is opening the door to compromise on the key NAFTA issue of auto manufacturing, though it's unclear if the flexibility is enough to reach a deal with the U.S. and Canada, according to four people familiar with the talks. In talks in Washington on Monday and Tuesday, Mexico for the first time indicated a specific level to which it's willing to raise North American automotive content -- 70 per cent, according to the people, who asked not to be identified discussing private negotiations. While that's up from the current 62.5 per cent, it's unclear if it's enough to strike a deal because the U.S. has been calling for 75 per cent for the biggest components of cars. Mexico is also seeking to implement the changes more slowly than the U.S. wants -- over a period of a decade, according to two of the people. The issue of auto wages remains contentious. While Mexican negotiators rejected a U.S. demand that almost half of every car be built by higher-paid workers, two people late Tuesday said the Mexican government left room for using some level of higher-wage production as a way to meet new NAFTA content criteria. Setting wages through NAFTA is controversial in Mexico's auto industry, and two other people on Tuesday said the Mexican proposal included no wage targets, underscoring the competing interests in the complicated talks. President Donald Trump has blamed low-cost Mexican production for the outsourcing of U.S. manufacturing jobs south of the border, which was a key motivation for him to demand the 24-year-old pact be renegotiated last year. U.S. proposals have been oriented around increasing Mexican salaries and providing incentives for auto manufacturers to either move production back to America or at least stop investing so much south of the border. The U.S. wage proposal "is likely to price Mexico out of the market -- by all accounts, Mexican negotiators are well aware of that," Phil Levy, a former senior trade economist in George W. Bush's Council of Economic Advisers who is now a senior fellow at the Chicago Council on Global Affairs, said in an interview with BNN Bloomberg television on Tuesday. "And that doesn't actually help any of the North American producers, so it doesn't seem like a terribly viable strategy." The press office of Mexico's Economy Ministry and the press office of U.S. Trade Representative Robert Lighthizer declined to comment,. The most interesting Mexican proposal may have been an option -- Mexico responded to U.S. demands on steel, aluminum and wages by saying cars would have to essentially check off a box on one of the three issues, according to two people familiar with talks. Mexican Economy Minister Ildefonso Guajardo said the Mexican auto proposal was discussed in a bilateral meeting with the U.S. on Tuesday. "We are trying to accommodate the different positions" on autos, he said. "But again, autos is only one of many items." Lighthizer is pushing for a deal this month as the country's attention shifts to China, and as the U.S. weighs permanent tariffs or quotas on steel and aluminum imports from certain allied countries, including Canada and Mexico. Exemptions from tariffs have been tied to NAFTA talks and expire June 1. Jerry Dias, the head of Canadian labor group Unifor who consults regularly with the nation's negotiating team, said in an interview Tuesday that he still hadn't heard of Mexican willingness to accept automotive wage levels in NAFTA. "It completely ignores the two basic principles of the U.S. proposal, which talks about a wage level and a percentage of the vehicle that has to be be built with that wage," Dias said. "It leaves us a long way from a deal." Under timelines of U.S. trade law, the Trump administration has only a few weeks or so left to present a deal to Congress and put wheels into motion on passing the agreement this year. Lighthizer has warned that waiting for the next Congress will change the outlook. Several other sticking points remain as the clock ticks down. They include a U.S. proposal for a sunset clause that would kill NAFTA after five years unless all parties agree to extend it; U.S. demands to limit Canadian and Mexican access to American government contracts; wrangling over whether to keep panels that adjudicate certain disputes; and a U.S. desire to break open Canada's system of quotas and tariffs on dairy. The Mexican proposal on wages falls short of what the U.S. has reportedly sought. The Trump administration has been proposing that 40 per cent of a car, and 45 per cent of trucks, be made by workers earnings wages of at least US$16 per hour, Mexico automobile association President Eduardo Solis has said. His group says that proposal is unworkable. The U.S. Trade Representative's Office hasn't made public the American autos proposal. Mexican elections are scheduled for July 1 and look set to bring change. Mexican left-wing presidential candidate Andres Manuel Lopez Obrador, who has stoked investor concern with some moves, has consistently led in polls. U.S. midterm elections are set for the fall. Canadian Foreign Minister Chrystia Freeland downplayed expectations for a quick agreement. "We've always been committed to take the time it takes to get a good deal," she told reporters Tuesday in Washington. "If we don't see progress soon probably we won't see it for quite a little while toward the end of the year, if at all," U.S. Commerce Secretary Wilbur Ross said at an event on Tuesday.